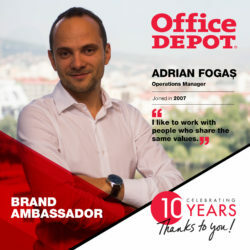 Today you get acquainted with our colleague Adrian Fogas. Adding passion in what you do does not only help you to be more enthusiastic but, also, allows you to be surrounded by different personalities from whom you can learn various perspectives. This is how Adrian enjoys his time at Office Depot. You can find more details below. 1. Please tell us something personal about yourself. I like sports a lot. I played field tennis for 8 years. I went to races in the mountains. I go swimming every other day now. So, I’m really into sports. I don’t have a huge amounts of friends. I have 10 or 15 but really good ones. I like to be around people who have the same values like I do and I have really strong friendships since I was 5 years old. 2. Tell us about your role in OD. Right now, I’m Operations Manager for the Accounts Receivable department – contracts side – for UK, Ireland, France, DACH and Belgium. Basically, it’s a mixture between developing people and keeping the operations where they should be. What I learned throughout my 10-year experience, out of which 8 years were in people management, was that without people you cannot do anything. So, this is where I put my efforts, developing my team and myself because I cannot develop without them. 3. Now going back at the beginning of your journey in OD, can you share with us what your job title was on the first day? I had absolutely no clue of what I was going to do. I actually just wanted the job. I graduated from university and my parents told me that if I don’t find a job in a month then I will be obliged to go home or I can stay in Cluj, but they would cut my funding. So, I was really desperate to find a job. I applied and had an interview with our current CFO for a Team Leader position and I knew after 5 minutes of discussing with him that I wouldn’t receive the role due to lack of experience. After the discussion I told the CFO to give me whatever position is available and I’ll prove that in a year or two I will be suitable for a leadership position. So, I got hired as a Process Assistant, then promoted to Process Specialist and then after 8 months or so I got promoted to a Team Leader position. This is what actually happened, I got really passionate about the work and made sure I didn’t go back to a small “rural” town. 4. What do you remember of your first day at OD? Describe some memories of how it was back then. I remember some of the trainings we had and the people from UK who tried to tell us what would happen. We looked at the procedures and started to have some shadowing in terms of calls and getting to know the system and it was really great because I’ve never seen during my studies theory put into practice and tools like SAP. I still remember a funny moment when our CFO paid us a visit and agreed that at the end of the working time, 10 or 15 people, to go out. We said that he should be at the terrace in the center of the city at 7:30 pm. We forgot about this because we got stuck with some reports. And I think it was 8 pm when we remembered that we have a meeting with him. Everybody jumped in taxis to go there and our CFO was already on the terrace waiting for us. At the terrace there were several tables and in the middle there was our CFO, alone. And people were staring at him, alone, at a big table. It was really funny and every time he comes here he keeps reminding us as a joke that we left him there alone. 5. What was the funniest moment which you experienced at the current role? What happened? 6. What was your biggest achievement up until now? I think it’s the one that I made the decision to be independent and this one related to my personal characteristics. Until I graduated faculty the only job I had was 4 months working in the USA. This experience somehow changed my personality because we are sort of used here to be offered everything easily and it was a decision I made to focus on my independence. There were lot of challenges from my parents saying to come back in my hometown. And if I look back now, 10 years later, since I took this decision I think it was a really good one. I wouldn’t put the fact that I became a team leader or a manager because I think this was actually a chain reaction of the incipient decision I took to be independent. I think it developed me as a person. 7. Give us some tips on how to achieve success in one’s career. The first advice that I give to people is to be passionate about what they are doing. There is no point in being compliant and go to a job that you don’t like or doesn’t bring you added value. If you are looking for short term satisfaction this is exactly what you get. In a job or in personal relationships, if there is no passion then, in my opinion, it’s useless. Let me give details about what passion means to me. I am a competitive person and I think this helped me in my professional career. Then I think there are people that you decide to be surrounded by and I like to work with the people that I always have to learn something from. It didn’t matter if they were managers or junior associates. 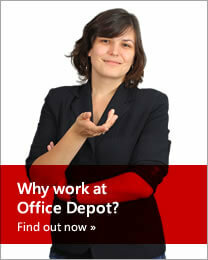 Also, having role models in Office Depot helped me a lot in developing further my passion. I always like to work with people who share the same values. The values I stand by are integrity, transparency (for example: talking with other persons) and having empathy. Another principle that I do believe in is work-life balance. I like to read news a lot, I’m doing this since I was in the 7th grade. I recall that I read about Brian Dyson, the CEO of Coca-Cola, and he said that there are 5 aspects that are really important for any person. He made a comparison with 5 glass balls that you keep in your hand: work, family, health, friends and spirit. Work is like a rubber ball – it bounces back – whereas the other four, if you drop them on the ground, probably they won’t break from the first time but they can have marks and these marks can last forever. You really need to understand that maybe doing long hours won’t help your personal life or maybe focusing only on the personal life won’t help you in the professional life. And I think this work-life balance has tentacles on the empathy that I talked about, passion, transparency. 8. What were the biggest challenges which you faced here? How did you manage to solve it? My mind is usually set to look at challenges and feed myself from them on a daily basis. It is a bit difficult for me to pinpoint the most difficult challenge that I’ve had so far. I could, for example, think that I started an MBA a year ago and it’s the most difficult program that I’ve ever been involved in. When you are taking your bachelor’s degree you are saying it’s the most difficult exam that you have. This MBA was a bit challenging at the beginning and I tried to find an hour every other day so that I can include it apart from my professional or personal life. 9. What are the top 3 things you love about OD. I like the atmosphere here – it’s like a perfect blend of challenge, fun, support between peers which makes every day to be enjoyable. I like the possibilities that the company offers to people in terms of development. We do have a pyramid structure and it’s just really nice to see how many opportunities of development you can have. The parties – they are epic. My grandfather from my mother’s side is one of the persons that I cherish most. He is a really good person working on the field. My grandparents had, like it is in the movies, the house on top of the hill with a huge garden. Even though he was a simple person, he was calm and taught me a lot of things that I keep on reminding myself whenever I look back at the time when I was a kid. One of the sentences that always pops into my mind is: “What goes around, comes around”. I was able to read between the lines and realized that the way I treat people at a certain point will always come back to me. If I treat them well, somebody will treat me well after a certain period of time.